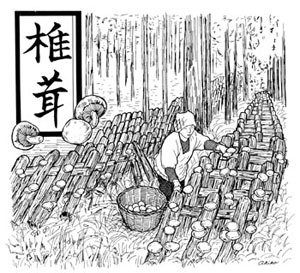 Shiitake are a great way to introduce people to the exciting world of Japanese health foods. They are delicious, nutritious, and can be used dried or fresh to add a gourmet flair to both ethnic and Western style cooking. Moreover, all eight amino acids are present in a ratio similar to the "ideal" protein for human nutrition. Shiitake are rich in the amino acids leucine and lysine, which are deficient in many grains. Shiitake are also a good source of B vitamins, including the ever-elusive B12. (Vitamin B12 is synthesized solely by bacteria and fungi, and is not available from vegetables.) It is, however, shiitake's medicinal possibilities that are getting worldwide attention. In the last two decades, scientists have isolated substances from shiitake that may play a role in the cure and prevention of modern civilization's dreaded illnesses: heart disease, cancer, and AIDS.